Many Pakistanis perhaps do not know that there are snow leopards in Pakistan’s northern mountains, mainly in Gilgit-Baltistan (GB) region. Moreover, it is little known that the snow leopard population is in perpetual conflict with farmers who live in these mountains too. Snow leopards frequently kill domestic goats and sheep which are farmers’ precious resources. Sometime snow leopards come down in the villages from their mountain lairs and jump into a livestock corral (a pen or enclosure used to restrict livestock) engaging in ‘surplus killings’. In some instances a single snow leopard has killed up to 50 animals in an attack. Research on snow leopard diet shows that globally 25% of snow leopards’ food is based on domestic livestock. This number is twice as high for Pakistan. In some ways, farmers unwittingly subsidise snow leopard populations. Despite a ban under the GB Wildlife Act of 1975 on killing and shooting snow leopards, farmers retaliate by killing the animal using various methods such as trapping, poisoning a snow leopard-killed carcass or even direct shooting. Farmers say that they have nothing against the predator, but they have to protect their livestock. There is an ongoing battle between the farmers and the provincial wildlife departments in GB and Khyber Pakhtunkhwa over this issue. Last year, farmers in Misgar, Hunza, trapped a snow leopard that had killed tens of their livestock. The villagers refused to release the snow leopard and demanded compensation from the government wildlife department. Some villagers stated that rather than paying compensation, some state officials threatened them with a police case and imprisonment. This kind of heavy-handedness is usually not a very helpful response to the demand for compensation by the affected farmers. The state officials and conservation institutions advocate conservation of the snow leopard on its uniqueness and ecological functions. From the point of the farmers, the snow leopard is a vermin and a threat which needs to be eliminated. How do we reconcile these two different views of a single animal? This is the crux of what is known in conservation literature as human-wildlife conflict. A young male Himalayn Ibex in snow, a natural prey for the snow leopard. For conservation NGOs and government agencies, the problem of farmer-snow leopard conflict begins and ends with farmers. There are three main explanations about the farmer-snow leopard conflict that prevails among conservation institutions and state officials. 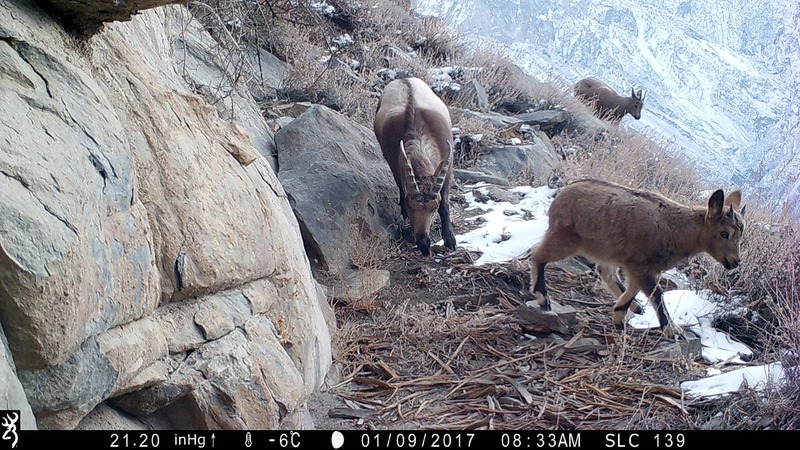 First, state agencies and conservation institutions argue that snow leopards kill farmers’ domestic livestock because farmers have hunted snow leopard’s natural prey which are wild goats and sheep such as ibex, markhor and blue sheep. Second, they maintain that snow leopard attacks on domestic livestock occur because farmers are lazy and do not protect their livestock effectively. Third, they state that the snow leopard habitat is shrinking and getting degraded due to farmers’ activities, so snow leopards have nowhere to go but towards human societies. While all three of these explanations are true to some extent, they do not tell the whole story. Rather, they tell a story from the point of view of conservation institutions and state officials. 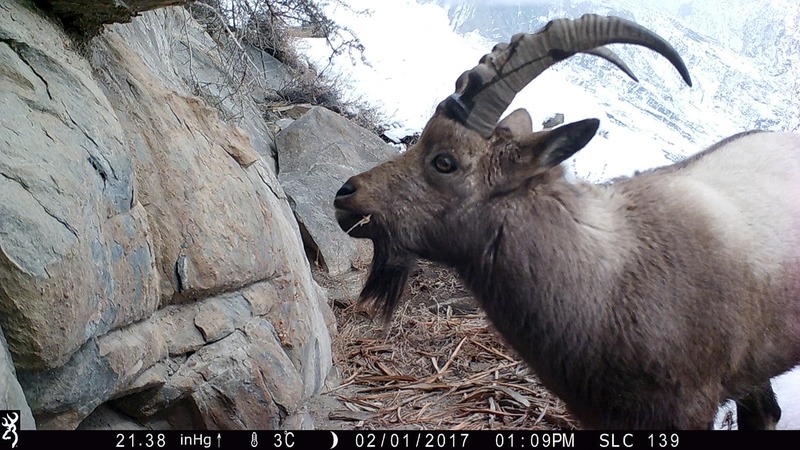 First, evidence shows that decrease in natural prey is not the only, or even overwhelming, the reason why snow leopards attack domestic goats. In fact, livestock predation is higher in villages where natural prey is also found abundantly, and this is why we notice a high predation rate in villages near national parks which harbor good prey populations. The reason is that a snow leopard is an opportunistic predator: it will take prey that is easier to catch. A domestic goat is perhaps 10 times easier to catch than an ibex. The second reason that farmers are lazy is based on lack of familiarity with grazing conditions on open ranges by those criticising. I have spent the last 20 summers in Baltistan, visiting high pastures where farmer graze their livestock. Protecting a herd of goat in that landscape is impossible because of the cover it provides a predator and because of snow leopards’ stealthy nature. Himalayan Wolf in Basho Valley. Farmers say that snow leopards are like suicide bombers; one doesn’t know when and where they will attack. Despite this, many attacks are averted due to farmers’ vigilance and hard work, but it is foolish to expect that there will never be any predation. The third reason that the snow leopard habitat is fragmenting and degrading is overblown. Up until the early part of the 20th century, tigers and lions were also found in Pakistan, mainly in the plains of the Indus River Delta in the south, but they are gone now. They were eliminated not through hunting alone, but primarily because their habitat was converted into agricultural fields and towns, cities and roads. The snow leopard lives in the harsh mountainous terrain, covered with ice, snow and rock, at an altitude of between 10,000 and 20,000 feet. Its habitat has little appeal and use for humans. This is the reason that the snow leopard range and habitat in Pakistan and worldwide has not decreased despite explosion in population growth and technological advancement in South and Central Asia. In comparison, the tiger is restricted to only 7% of its historical range today and its habitat has declined to less than 10 percent of its size in the 19th century. The threat of habitat degradation emanates from global changes induced by consumption and production of advanced industrial societies, not from the subsistence practices of local farmers. In order to address farmers’ concerns for their livelihoods and protect this remarkable species, I started a pilot project called Project Snow Leopard (PSL) in Rondu Valley in the northern region of Gilgit-Baltistan. The pilot project was conceived to test the idea of an insurance scheme for domestic livestock (sheep, goat, yak, dzo, dzomo) of Balti farmers against snow leopard killings. This was the first time anywhere in the world that the idea of a community-based livestock insurance scheme was being tried out. The idea of an insurance scheme is based on a simple premise: by killing snow leopards, farmers take a rational decision to protect their livelihood, and in order to stop the farmers, conservation organisations and government agencies must compensate them for their losses. The project therefore sees snow leopard conservation from the point of view of conservationists and farmers. From one project village in 1999, PSL expanded to 10 in 2006 and to 17 in 2013. In 2007, PSL was formally registered under a non-profit organisation called the Baltistan Wildlife Conservation and Development Organization (BWCDO). Today, there are 15 insurance schemes running in 26 villages across three valleys in Baltistan. Admittedly, these are small funds (about Rs200,000 to 300,000), but they are growing. We have paid out about Rs2.4 million in compensation funds to farmers since 2006, thereby reducing their incentive to retaliate by killing the snow leopard. Our insurance scheme model has been emulated by Pakistani NGOs and government departments alike. Recently, the directorate of Central Karakoram National Park (CKNP) started an insurance scheme based on our model. This is a welcome sign and must be encouraged, but more funds need to be spent on these government-run insurance schemes and less on making plans that cost a fortune (consultant fee, technical advisor’s fee etc) and which no one will implement. The BWCDO model has also been attempted in other snow leopard home range countries, including Nepal, India, Mongolia, and Bhutan. In addition, we have done solid research on snow leopard population, including camera trapping, population genetics, and were the first organisation to revise the snow leopard population estimate for Pakistan since Schaller’s assessment in the 1970s. BWCDO has carried out awareness raising campaigns in 26 villages across Baltistan on an annual basis. This includes publishing of a snow leopard book in Urdu and holding debate and writing contests on the benefits of snow leopard to ecosystems. As part of a community incentive program BWCDO is providing financial help and environmental awareness material in 25 schools across Baltistan. 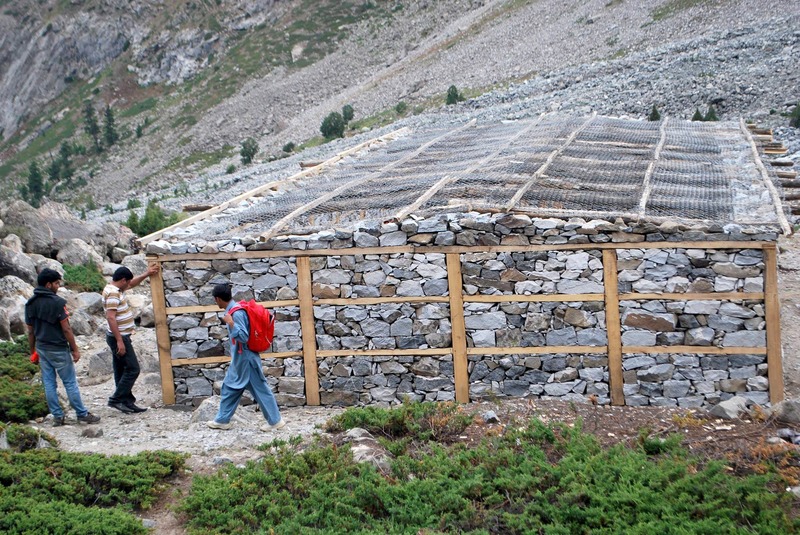 In order to stop snow leopard attacks on corrals, BWCDO has built predator-proof corrals for the communities. 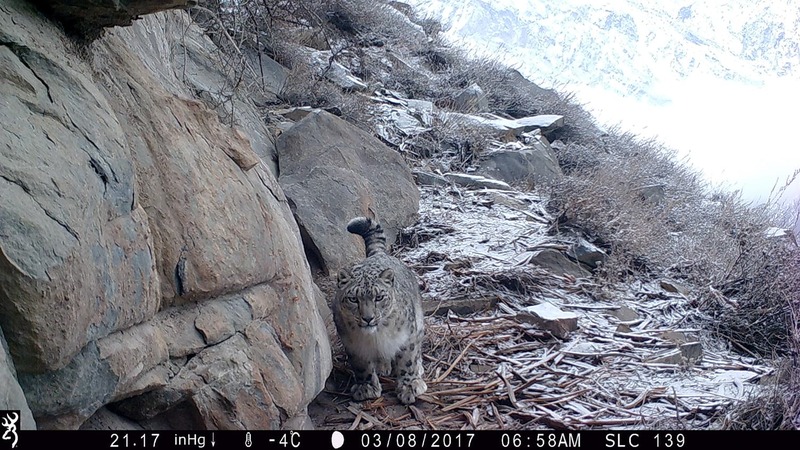 Under grants from the National Geographic Society’s Big Cat Initiative and support from the Snow Leopard Conservancy, BWCDO has spent seven million rupees in building 45 corrals throughout Baltistan and this figure in increasing. Predator-proof corral in Basho Valley. BWCDO/PSL has won several prestigious international awards, including the Whitley Award in 1999, the Rolex Award for Enterprise in 2006 and the National Geographic Emerging Explorer Award in 2009. In 2017, won the UNDP Equator prize for innovative, grassroots solutions to environmental problems. Despite their increased acceptance in conservation practice, insurance and compensation programmes remain highly contested and subject to a variety of critiques. The main criticism is that such programmes are not efficient but expensive, thus not sustainable. We found this to be partly true, but this is no reason to abandon the approach, rather to fund it even more. Insurance schemes are efficient, if run and managed by local communities. But they do suffer from lack of money from international donors and even government agencies who do not like cash transfers to the poor on (neo-liberal) ideological grounds. What if, in reply to the argument that insurance schemes are too expensive to run, farmers say that in the absence of any compensation mechanism, snow leopard conservation is expensive and unsustainable for them. Moreover, alternative approaches are equally flawed and suffer from financial and technical constraints, but we seldom hear calls for their abandonment. The main reason is that in the alternative approaches the money is ‘wasted’ by conservation professionals and government officials, while in the case of compensations schemes, they are ‘wasted’ on communities. Our main challenge so far has not been to convince the local people to protect the species, but, rather, it is to make state and conservation institutions realise that snow leopard conservation is not only an ecological imperative, but it is also a political and economic one. Barring a few exceptions, there is, however, little sympathy for social sciences amongst wildlife conservationists. State agencies and national and international conservation organisations are mainly staffed by natural scientists with little training and interest in the social dimensions of conservation. Thus, we see very little attention is paid to social issues such as economic and psychological cost of conservation to communities. The image of the snow leopard that prevails in such institutions and organisations is that of a ‘wilderness’ predator, that iconic American cultural idea which is based on worship of ‘pristine’ and ‘untamed’ nature. But research from the field shows that snow leopards live close to human societies and indeed, as mentioned above, depend on them for their sustenance. Ecological research from India, Nepal and other areas on snow leopards-livestock relationship show that if humans and their livestock are removed from the snow leopard habitat, the ‘natural’ prey of snow leopard and eventually the snow leopard population itself will decline. Ignoring this link between wild snow leopards and domesticated economy can be detrimental for the snow leopards in the long run. Explore: A bear for a human life: Who is the predator in Mansehra’s human-bear conflict? Due to BWCDO’s efforts over the last two decades, the snow leopard population in Baltistan is stable. 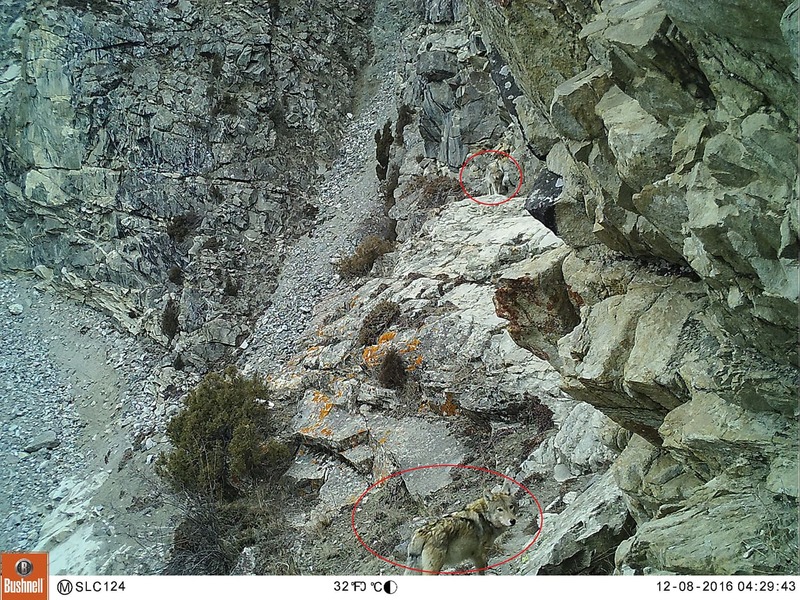 There are currently between 30 and 40 snow leopards in BWCDOs project area, and between 300 and 400 in Pakistan. In September 2017, The International Union for Conservation of Nature (IUCN) downlisted the threat level to snow leopard from Endangered to Vulnerable, indicating successful efforts to conserve this species in Pakistan and worldwide. But this revised status should not been seen as a signal to stop working for the protection of this species. We need to do more and continue to fund conservation action on the ground such as insurance schemes and predator proof corrals to alleviate the social and economic cost of conservation to communities. When I was in Misgar last year, I heard one of the villagers say that many NGOs working for snow leopard conservation are “dollar walaNGOs,” meaning that they spend money on strengthening their own organisations rather than on compensating farmers for their losses and building predator proof corrals. The farmers in Baltistan are not country bumpkins who do not understand the political economy of international aid and conservation. In so many words they remind us that we, the NGOs, who are a bridge between society and state, must see conservation from their eyes.